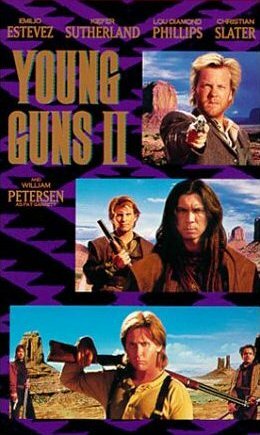 Geoff Murphy delivers a spectacular display of brining John Fuscoâ€™s characters to life in the second and final installment of John Fuscoâ€™s Young Guns. Starting out a lawyer stops in the New Mexico desert in the 1950â€™s to talk to an elderly man who claims to be Billy the Kid, when asked if he has any proof, scars and so on the elderly man begins to tell his story. Set again in the late 1800â€™s once again we join the Regulators who are being chased down one by one for their involvement in the Lincoln County War. Billy the Kid the nations number one most notorious outlaw is being hunted down by every lawman in the west, the story focuses on Pat Garrettâ€™s pursuit of the Kid and the rest of the new Regulators who have been recruited by Billy himself. In a hunt for the Kid many battles and chases take place until the final encounter between Billy and Pat and the gunshot that ends it all. Or does it. For a sequel this movie falls short of the original but still stands alone as a magnificent western. The filming by Geoff Murphy was excellently done bring this high action story to the big screen. With less of a love story involved as the first one it gives all the entertainment of the first. Emilio Estevez, Kiefer Sutherland, and Lou Diamond Phillips all return to their rolls from the first film with the addition of Christian Slater, Alan Ruck, and Balthazar Getty fills out the newest members of the Regulators. With William L. Peterson filling the shoes of the late great Pat Garrett, the acting did not fall short on this film. With a great story line bringing to life the true accounts of a man coming out in the late 1950â€™s claiming to be William H. Bonney, it was dismissed in court since there was no physical proof to support the mans story. For anyone who enjoyed the first film this is a definite one to watch.